Why all rugby players need a personalised rugby boot bag? After such a glorious summer it is hard to believe we are now in Autumn. And for many families that means rugby and football kits are now littering the laundry. Men and boys around the country rejoice. Whilst mums have the sheer delight of wet muddy kit to wash and contend with on a twice-weekly basis. Only one thing makes it worse, and this is when the wet muddy boots are left festering directly next to the kit. And trust me when I say nothing smells worse than wet muddy rugby boots. And when the little darlings just throw their boots in with the rest of the kit, you are just asking for trouble. The sports bag will hold that smell forever and a day. We are told football boots are equally as bad. It only needs to be left for a few hours and the smell is there forever and a day. You open the sports bag and bang the smell hits you. And boy does it hit you! Furthermore those teeny weeny little bits of dirty grass are like glitter and sand, you simply just cannot get rid of them, no matter how hard you try. And the best is yet to come because when that wet mud dries in sports bag, it soon drops off onto the the nicely wash kit. Well with a personalised rugby boot bag this will soon be a thing of the past. A personalised boot bag will keep the boots contained and away from the rest of the kit. So come the spring/summer sports season, the sports bag won’t stink out the changing room. and with a choice of print colours. 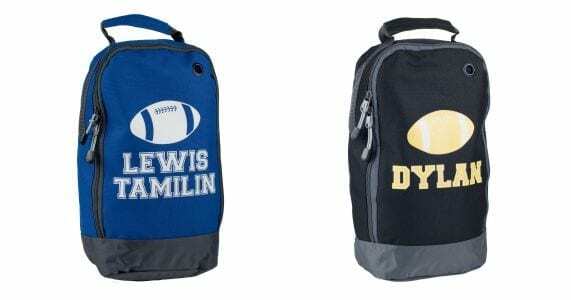 The personalised rugby boot bag will feature the rugby ball motif and your chosen name or text. The text is printed in the very popular USA college font, making it super clear to read. Each and every boot bag is individually hand printed by name it labels. And better still there is no maximum character restriction. Just remember though that the longer the name the smaller the print appears. It is a super size and will even hold adult size rugby boots. As one lovely customer recently told us: the bag is big enough for boots, drink bottle, mouth shield and a jumper squished inside the bag. Because the bag is made from super strong polyester and features a handy grab handle. Thus making it ideal for carrying boots to and from the rugby field. Furthermore when not playing rugby, the boot bag offers he best place to keep boots together ready for the next big match. Hopefully putting an end to those morning panics looking for that 1 missing boot! There is a mesh pocket on the rear, perfect for holding a drinks bottle to keep them hydrated. The bag has a wipe clean interior, but probably the best feature is the authentic metal ventilation eyelet. Somehow by magic it lets out just enough to keep the boot bag from smelling. Click here to shop for a personalised rugby boot bag.